Glenwood’s Carnegie Library was built in 1908 and expanded in 1998. Local residents requested funds to build the library from Andrew Carnegie who offered to build a library for any town which could provide a site and commit to public funding to operate it. It was designed by A.S. Foss of Elbow Lake as a Neo-Classical Revival building. Symmetrically placed rectangular windows at the main level are in recessed panels. The entrance pavilion houses a recessed entrance with the name “Carnegie” over the door and two concrete Doric columns. A complete pediment at the top of the pavilion features three projecting acanthus leaves at the points of the pediment. A dentillated cornice and wide frieze board circumvent the structure, with the words “Glenwood Public Library” on the frieze of the pavilion. The interior of the building retains most original structural features. 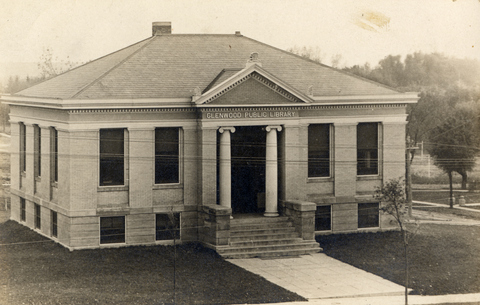 Once the funding was approved in 1907, the community couldn’t wait for the building and immediately bought 125 books through the State Library Commission and started a temporary library, run out of the Glenwood State Bank. The initial order of book included 25 books for young readers, 25 boy’s books, 25 books for adults and 25 books in Norwegian. 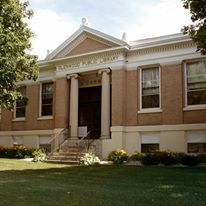 The Glenwood Public Library is one of the few Carnegie Libraries in the country that is still used as a public library. Before the library was built, the site was home to Glenwood’s Fire Department. This entry was posted in Local History and tagged Carnegie Library, Glenwood 150, Glenwood Minnesota, Glenwood Public Library, Pope County Historical Society, Pope County History, Pope County Minnesota, Pope County Museum. Bookmark the permalink.